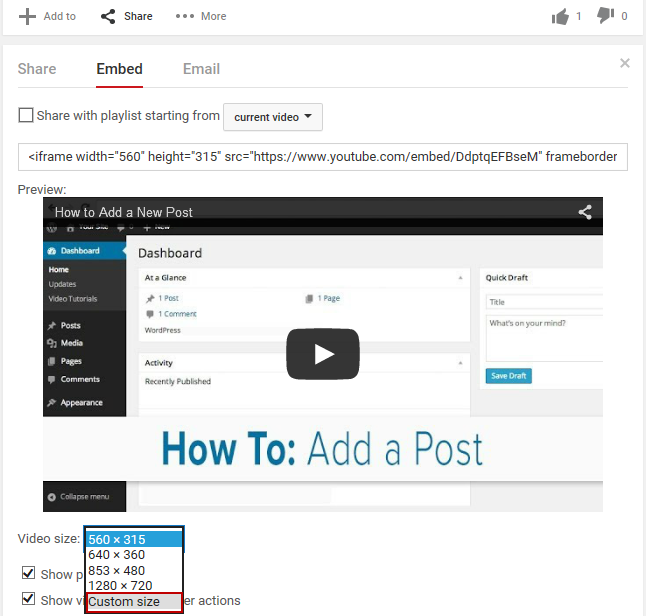 YouTube videos can easily be embedded into posts, pages and in widgets. 1. Click on the Share link under the YouTube video. 2. Copy the Video URL. 4. 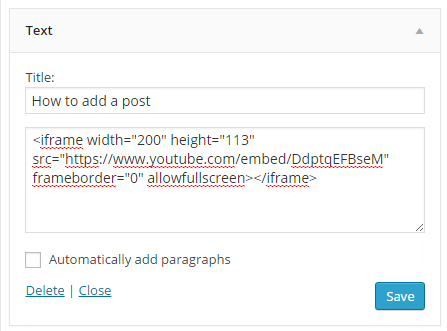 Paste the URL on a line by itself in your post editor. The URL will change to a preview of your video in your Visual Editor. The link must be on its own line without any characters or whitespaces before or after the URL and must not be hyperlinked otherwise it won’t embed. You can tell if a URL is hyperlinked by clicking on the link. If the hyperlink button in the toolbar highlights and a link box with the option to edit appears, like the screenshot below, it means your link is hyperlinked. Click on Remove Link icon to remove the hyperlink. You can also embed videos using their embed code. 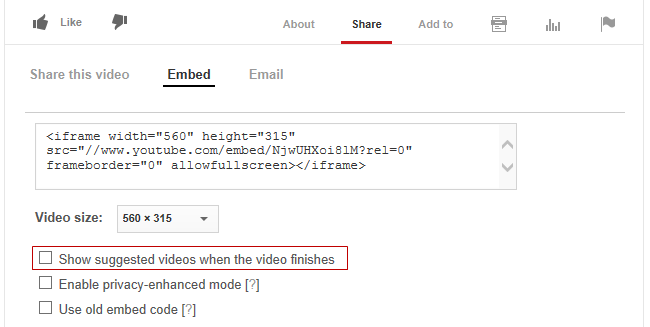 This is handy when you want to change the size of the video embed or remove related videos when embedding YouTube videos. 1. 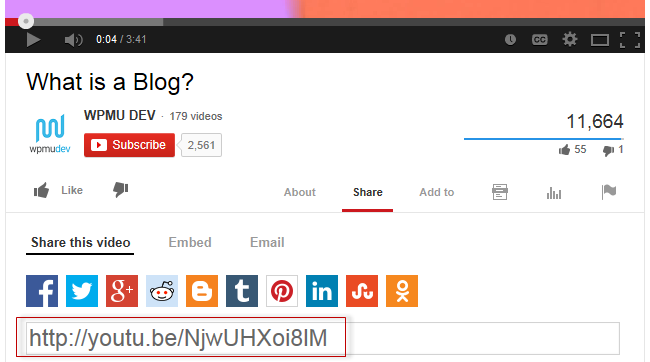 Click on Share underneath the YouTube video you want to embed. 3. Deselect Show suggested videos when the video finishes. 4. Copy the embed code. 5. Go to Posts > Add New or Pages > Add New. 6. Place your cursor where you want the the video to appear and then click on the Add Media button. 7. In the Add Media window click on the Insert Embed Code tab. 8. Paste the video embed code into the embed code field. 9. Click on Insert into Post. 10. Your Add Media window will close and the embed will appear in the visual editor as shown below. 11. When you view your published post you will see your video. Depending on the location of your theme’s widget areas, you can also embed YouTube videos in your sidebar or footer by pasting the YouTube embed code into a text widget. 3. Click on Show More. 4. Select Custom Size from the Video Size Drop down menu option. 5. Add your desired width and the height will automatically be added. For most sidebars you need to use 200 or less. 7. Log into your blog. 8. Go to Appearance > Widgets. 9. Click on the triangle on the right side of desired Sidebar to expand (so you can add the widget). 10. Drag a text widget into your sidebar. 11. Paste the embed code into the text widget. 12. Click Save and Close. 13. You should now see the widget in your sidebar.